US, 2005, 109 minutes, Colour. 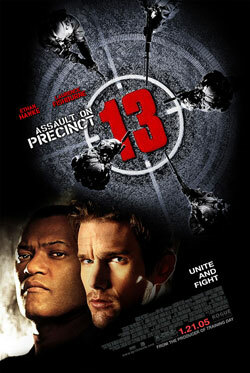 Ethan Hawke, Lawrence Fishburn, Brian Dennehy, Maria Bello, Gabriel Byrne, Dreya de Matteo, Matt Craven, Kim Coates. Directed by Jean- Francois Richet. This evocative title brings to mind the classic thriller written and directed by John Carpenter in the mid-70s. As with so many new versions of an older film, the recent film-makers prefer to use, instead of re-make, the words re-imagining or reinventing. This is justified in this case as the present version has the blessing of Carpenter who, it is said, suggested that the street gang members who besieged the precinct become crooked police. He thought it more relevant to today’s questioning of all authority figures. The film opens intensely with a drug deal and a tour-de-force display by Ethan Hawke. We are in Detroit, in winter, New Year’s Eve, heavy snow and a skidding police bus which has to detour to shelter its prisoners in the decrepit precinct building which is about to close down. In charge is the traumatised sergeant, Hawke, with subordinates Brian Dennehy and Drea de Matteo. The sergeant’s counsellor, Maria Bello, is forced to shelter because of the weather. The principal prisoner is a local gangster, Laurence Fishburne. The group is unwilling to take in the gangster but when masked gunmen open fire and they find that it is a corrupt police squad led by Gabriel Byrne, the forces unite for a very long night. This is an effective blend of action and character studies, quite exciting and a powerful reminder about our violent responses when we are foced into self-defence. The director is French, an enthusiast who admires the work of American action directors. He pays homage to them as well as to John Carpenter. He gets strong performances from his cast and the screenplay is far grimmer and less romantic than what we might expect. Not bad at all of its type. 1. The classic status of the 1976 film? John Carpenter’s work? The homage to Rio Bravo and the western tradition? The urban frontiers, police, law and order, gangs? 2. The contrast with the 2005 version? A homage, a reinterpretation, a re-imaging? The west in the city of Detroit? The same urban frontiers? The transition from gangs to corrupt police, crises of authority, crises of law and order? 3. Detroit, the city, New Year’s Eve, the cold, the snow, traffic held up, the isolated precinct, the urban factory setting? The role of the police, law and order in this context? 4. The importance of the action sequences, style and filming, editing and pace? The building up of the characters over the night of the siege? Conflict of characters? The musical score and tone? 5. The title, its tone, the night of the assault, from night to day? 6. The prologue, Jake and his performance as a drug dealer, dealing with the men, the criminals, the revelation that they were police, the shoot-out, his decision for the escape, the consequences, the killing of his partners? His psychological troubles? Being ordered to go to therapy? His low self-image, putting himself down? His going to the old precinct, shutting it down, at the desk? Not wanting to take responsibilities? 7. Bishop, seen in the church, the ceremony, the deal with the undercover cop, the shootings? His escape, being caught, charged, the situation of no bail? 8. Marcus, his authority, role amongst the police, his assistant, their watching Bishop, his arrest? Their discussions – and the revelation of their being crooked? The long deal with Bishop? Trying to destroy him? 9. The police bus, Smiley and Anna, the types, the drugged lawyer? The staff, their duties? The attack, the getting into the precinct, the discovering that it was the police attacking them? 10. Jake as a character, Ethan Hawke’s screen presence? His discussions with Alex, his resisting therapy, his stealing the file and reading it? Her visit to the precinct for the appointment, her getting caught and having to stay? Iris and her place in the precinct, its being shut down, wanting to celebrate New Year’s Eve, her duties? Capra, his presence, going, returning? Jasper, the veteran, his experience, his place in the shut-down precinct, the prospect of retirement? The group together to undergo the siege? 11. The character of Bishop, serious tone, his continued declaration of principles? The principle of protecting himself? His antagonism towards Jasper? In the cell, the other inmates, the discussions, the confrontations with Jasper? The discussions with Jake? His assessment of what was happening, the revelation about Marcus? His decisions to help, his saving Jake, the explanations of his stance? 12. Iris, her attitude, being with Bishop, the discussions about sexuality? Her relationship with Capra? Capra’s return, their suspicions of him? 13. Jasper, age, the veteran, helping, the confrontation with Bishop and the other inmates? His hostility, suspicions? The irony that he left the door open, that been bought by Marcus – and handing over the group to Marcus? His disdain for Jake as he left? 14. Smiley, his back-story, the guns? Beck, his continued chatter, the story of his being a law student, the drugs, his suspicions? Joining in the defence? Smiley and Beck taking the opportunity to escape, their plan, at the fence, their deaths? 15. Anna, her back-story, tough? Her going with Alex, their clash, igniting the car – and the sudden surprise of the crash and their deaths? 16. Alex, character, smooth therapist, her own insecurities, her technique for counting? The relationship with Jake? The therapy sessions, his taking the file? The attraction? Her having to face reality in the siege, her fear, counting, her finally volunteering to go with Anna, the crash, Marcus and his callous shooting her? 17. Marcus, the men, the equipment, the guns, the various attacks, their being repelled, the bus, disconnecting the wires, the other vehicles, cutting the phones? The confrontation with Alex and Anna and their deaths? The open door? Marcus finally getting the helicopter? 18. The dawn, the snow stopped, the cold, going out into the forest? Bishop and Jake, their tactics, helping each other, the death of Marcus’s assistant? The final confrontation with Marcus, the story? Marcus shot? 19. Jake, his drinking and pills, not wanting to take responsibility, his interaction with each of the characters, with Iris, suspicions of Capra, not suspecting Jasper? Organising the team, finally making a decision after the challenge? Getting out with Bishop, the tunnel underground, the escape, through the forest, the confrontation with Marcus, heroics, letting Bishop go? 20. Daylight, the end of the siege, right winning? The hard-hitting style – and the unpredictability of who survived and who was killed?